How big “JACAJmo se” was? How big JACAJmo se was? It was notorious fact how much attention events/action “JACAJmo se” drew at time when you read that some artists and institutions after start date tried to enter as exhibitors and contributors. Obviously was too late to be inserted in already printed material but some got involved with exhibitions prepared literally overnight. Rest entered as contributors 2nd week and shared information and material about the events with same passion. Children and families involved in event being directed to those as bonus to enjoy. There is the other side of popularity drawn from this huge event! – those were trying to ‘dock in’ to use popularity of the “JACAJmo se” to market themselves among entire motion. Some of them went that far trying to promote themselves. One in particular ‘launch article in local newspapers’ confusing public with their unofficial version of explanation of “JACAJmo se” submitting ‘proposal’ in the article for International Museum Day. 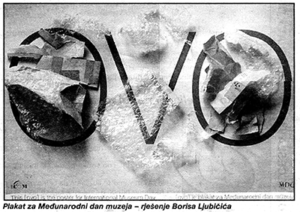 This proposal said: “OVO je muzej (eng. THIS is museum)” I guess expressing author vision of the institution and his response.